Barry is the firm’s Principal Planner and Company President. He has 30 years experience in land planning and development consulting. 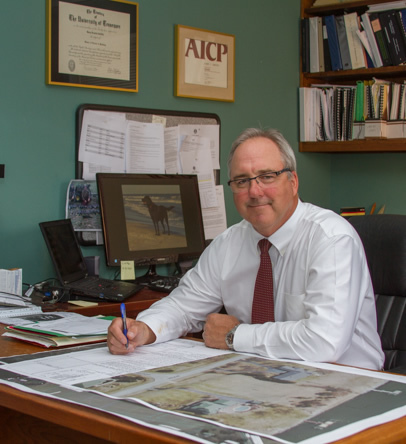 Prior to joining Lane Engineering in 2000, Barry worked as the Deputy Director of Planning and Zoning for both Talbot and Queen Anne’s counties. Previous experience also includes planning and development consulting for private and public sector clients throughout the Mid-Atlantic region. In 1987 Barry served as a planning and development consultant to the Cayman Islands, BWI. Barry is a 1984 Salisbury State College graduate and has a Master of Science Degree in Planning from the University of Tennessee. Over the years Barry has served on numerous civic and development related commissions and advisory boards in Talbot and Queen Anne’s Counties. As the Company President Barry directly manages and oversees the successful completion of many of the firms larger-scale design projects throughout the Eastern Shore and is the Managing Partner for the firm’s Centreville, Maryland office directly overseeing most of the firm’s work in Queen Anne’s County. Barry is a resident of Grasonville, Maryland.